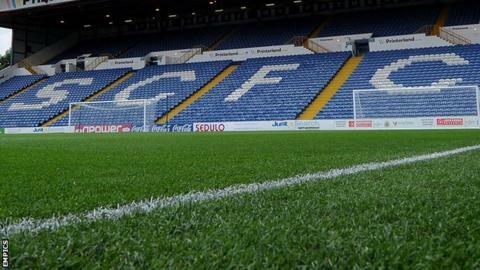 Blue Square Bet Premier club Stockport County have appointed 30-year-old Ryan McKnight as their new chief executive. McKnight will become the youngest male chief executive in English football when he starts on 1 February. He will continue in his position as chief executive of the World Football Academy, a company part-owned by former Chelsea manager Guus Hiddink and ex-Wales coach Raymond Verheijen. McKnight was also previously the editor of FC Business magazine. "I've only ever wanted to work in football and, although I'm only 30, I've got 10 solid years of working in football behind me," he told BBC Radio Manchester. And he is keen to end several years of financial uncertainty at Edgeley Park, adding: "What I'm going to do, first and foremost, is to create a club that doesn't allow the chance of what has gone on at this club in the past 10 years to ever happen again. That's an absolute must. "It's gone through a horrendous period of unnecessary pain and there's simply no need for that to happen again." The Hatters dropped into non-league football in 2011 and are struggling towards the bottom of the Blue Square Bet Premier this term, but that is not distracting McKnight from his ultimate goal - helping Stockport County return to the Football League. He continued: "Part of this is elevating the expectations of everybody connected to Stockport. "Not for one second am I going to allow anybody - and that includes the fans and everybody that works at this football club - to think that because of the hard times, it hasn't got the right or the resource to get back to where it was or beyond that. No organisation that I'm part of will be thinking like that. "That's clearly the goal, but the primary goal is creating an organisation with such a high standard of performance that these playing successes we're talking about are a by-product of that."